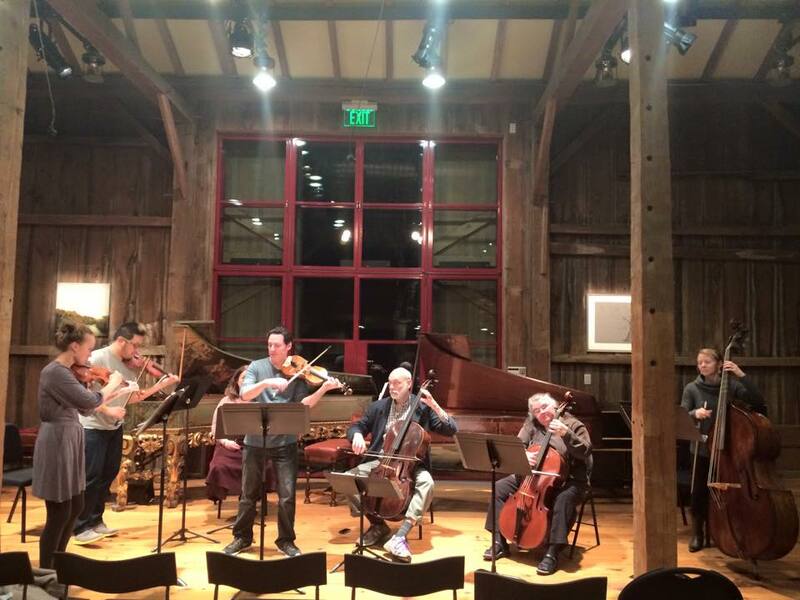 The program may have been titled “Winter’s Glitt’ring Sun” but it didn’t feel anything like winter on Sunday when Brandywine Baroque presented its second concert of the 2015-16 season. The well-attended concert featured works by Italians Vivaldi, Tessarini, Leo and Facoli and a secular cantata by Englishman Thomas Arne. The program was heavy on Vivaldi — no surprise there. Vivaldi’s fecundity never ceases to amaze. His reputation rests largely on a legacy of nearly 500 instrumental concerti. Yet this incredibly prolific composer was almost unheard of until the 1950s. The concert opened with a performance of the Concerto for Strings in d minor, RV 128. This work was contained in one of 14 volumes discovered in 1926 sparking interest in the composer’s works. All three movements are in the same key — unusual but not unprecedented for Vivaldi. It also adheres to the three movement fast-slow-fast order that he standardized. Double bassist Heather Miller Lardin reveled in the particularly active bass line of the Largo, while the entire ensemble engaged in a fugal finale bristling with energy and excitement. Flutist Eileen Grycky soloed in two of Vivaldi’s flute concerti: the D major and the recently discovered d minor “il Gran Mogol” which received its Delaware premiere. Grycky’s delightful and highly musical formation of the flute solo lines on her mellow, woody instrument were a delight to the ears as was the full-blooded energetic orchestral accompaniment. The strings had their say in a warm and sprightly reading of Vivaldi’s Concerto in G Major for Two Violins and Two Cellos, RV 575 — with Martin Davids and Kathleen Leidig, violins and John Mark Rozendaal and Donna Fournier, cellos. Davids joined fellow violinists Leidig and Edmond Chan in a confident, well-balanced and precise rendering of Vivaldi’s Concerto for Three Violins in F Major, RV 551, creating ear-catching textures spiced by Vivaldian virtuosic runs and arpeggios. The program also featured the works of other lesser-known Italian composers. Davids introduced the Concerto for Violin in A minor by his favorite composer, Carlo Tessarini, by saying he was luckier than Vivaldi because he didn’t wash out of the priesthood and wind up with an orphanage. Jokes aside, this tricky and challenging music demands a performer with virtuoso credentials and Davids certainly has them, especially in the Allegros of this work. Harpsichordist Joyce Chen’s elegant technique brought out the dimple counterpoint and right-hand embellishments in Marco Facoli’s Padoana prima dita Marucina & Salterello. Leonardo Leo’s concerti give little opportunity for virtuosic display; instead, the cello weaves its way in and out of the texture in a relaxed way. This performance by John Mark Rozendaal of the Concerto No. 3 in F minor is appropriately low-key, with the tricky problem of giving the instrument its proper prominence solved with admirable clarity. Soprano Laura Heimes performed the only non-Italian work on the program: Thomas Arne’s Cantata V: “The Morning” from Six Cantatas. It is always a pleasure to hear Heimes’ bright warm voice in concert. But this work displayed her virtuosity, as these areas demand astonishing breath control, mastery of coloratura and apt decoration. The interaction between voice and instruments proved engaging and inventive.